MIDAC Standards is a library of over 150 gas phase reference spectra. These spectra are needed because of the Clean Air Act amendments of 1990. 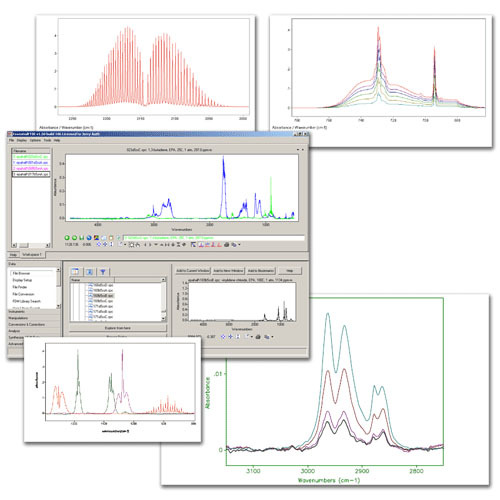 MIDAC Standards is a library of over 150 gas phase reference spectra. These spectra are needed because of the Clean Air Act amendments of 1990. These amendments have increased the number of hazardous air pollutants (HAP's) for which emission rates must be measured. Quantitative identification of toxic air compounds in an emissions source is more important than ever. According to the EPA Contract 68D90055 Draft Report on FTIR Technology Development, "FTIR has the advantage that a number of compounds can be detected simultaneously and unambiguously." But accurate quantification of compounds detected requires an extensive library of reference spectra. MIDAC's Standards contains over 120 quantitative gas phase reference spectra, including over 100 of the EPA's HAP's, specialty gases of interest to the semiconductor industry, industrial solvents, fluorochemicals, organics, inorganics, and acids. If a gas species of particular interest to you is not already contained in Standards, MIDAC may add it to the volume at minimal cost. Coupled with MIDAC's AutoQuant Software, Standards completes MIDAC's total solution to gas phase analysis problems. Spectra in the Standards volume are collected at multiple concentrations and variable temperature ranges. All spectra have been collected according to EPA protocol and are available at 0.5, 1, and 2 cm-1 resolutions. Subscribers are provided with free updates as the Standards library continues to grow. The spectra are in AutoQuant format and are directly compatible with EFTIR. With the proper conversion software, the spectra can be converted to virtually any spectroscopic format.